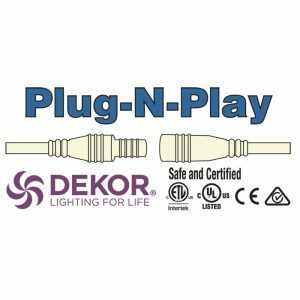 DEKOR® now designs the majority of our products Plug-N-Play™. We listened to the feedback from our customers, and simple, user-friendly installation was top of the list. Our Plug-N-Play™ Connector System is completely self-sealing, removing the need for stripping wires and wire nuts. Plug-N-Play™ takes the guess-work out of installation; no need to track the polarity (red and black wires) because DEKOR connectors are keyed to plug in the correct way. With the introduction of the new EZ Plug-N-Play™ Splitter, you can now junction up to 4 lights into one device streamlining the whole installation process. Do you DIY? If so, you’ll love the ease of installation. If you’re a professional, you will love how Plug-N-Play™drastically cuts installation time and cost.